I have been boxing since I was 15 years old. One day my god brother took me into a boxing gym and I immediately fell in love with the smell of the leather, the practice and the sound of my fist on the bag. After day one I felt more confident and stronger inside and out. The first person I sparred with was my trainer and he told me I had a great right hand and after sparring with him only three times he had to quit because I just hit too hard. From there I started challenging the guys in the gym, some of them were professional and I was giving them a real problem and I loved it. My fourth fight was against a guy with over 30 fights and it went to a decision. He won, but I knew I had what it took to go pro. In 1997 I was the runner up in the Chicago Golden Glove and went pro a few years later. As much as I loved professional fighting, I always knew that coaching would be my greatest achievement. I want to build my boxing legacy and continue to fight though other fighters. I love working with men, women and children. In fact most of my clients' husbands insist they come back, because it transforms their body and their spirit. They are happier with a body that is just rippling with muscle tone and definition. One client loved it so much, he got his two sons involved and his entire family has been boxing with me for over two years. Every day I recognize that I am blessed, because I get paid to do what I love. You will be pushed, inspired and empowered all while learning a practical self-defense skill and surpassing your fitness goals. I found my passion for fitness after discovering the world of aerial arts and circus. I became intrigued with the strength, flexibility, creativity and grace involved in the fascinating discipline. I love being in the air, and also enjoy contortion and hand balancing. I find it important to cross train. I like to incorporate various exercise methods and techniques. I emphasize on flexibility, mobility, body awareness and form, progressions, and self care. You have the option of exploring circus inspired workouts. I'll show you methods to improve your flexibility and move better. You'll have fun, be inspired, and discover your hidden super powers. My passion for fitness began when I trained for my first marathon in 2007. I found myself answering a lot of fitness and nutrition related questions people would ask me during my training and I decided to turn my experience into a career in personal training. Since running my first marathon I went on to complete 25 marathons in both the US and in Europe and I’m currently training for more. My passion for fitness and running only increased over the years since I began my career. I love the process and structure that training provides in order to reach a specific goal and the many different forms of exercise that can be used to accomplish that goal. I also believe in the healing that exercise can provide both mentally and physically. You will be challenged every step of the way no matter what your goal. Your fitness level will improve and the results will follow. I take each and every client’s goal personally and seriously and will keep you motivated to reach it. You will also experience many different types of training as I bring out the athlete in you. I began my martial arts journey at the age of 13. Boxing was and will always be my first love. I decided to learn how to box for self defense reasons, but was fascinated by the dedication, discipline and hard work needed to become a skilled fighter. I strictly trained and competed in the amateur boxing circuit for 8 years. At 21 years old I discovered kickboxing, which I continue to train and compete in to this day. I recently began studying the gentle art of Jiu Jitsu in 2016 as well. Although I consider myself a knowledgeable trainer, I realize I will forever be a student in this never ending quest to become the best martial artist I can possibly be. I will show you how to prepare your body for an intense workout where I will prove that you're able to do more than you ever imagined. I'm confident that training and learning boxing will bring just as much joy and benefit to your life as it has brought to mine. On top of adding self confidence and physical fitness, boxing/kickboxing have been proven to be effective self defense methods. Hopefully you will never have to use it in a real life situation, but as the saying goes "It is better to be a warrior in a garden than a gardener in a war." I started boxing with Johnny Higgins at Blockhead Fitness over 3 years ago and never looked back. 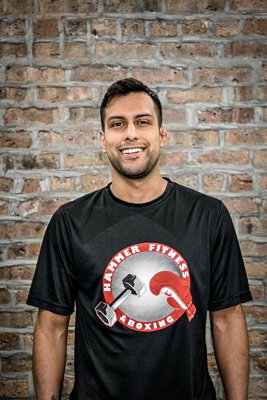 Now, as a Boxing Instructor and Personal Trainer at Hammer Fitness & Boxing, I’m thrilled to pass along my love of the sport’s intense conditioning, rigorous discipline and mental acuity to clients of all ages. Whether you are personal training or boxing, I’ll be pushing you at every session. My highest priority is helping you reach your personal goals, and I’ve got your back every step of the way, from our workouts at the gym to developing healthy nutrition habits at home.